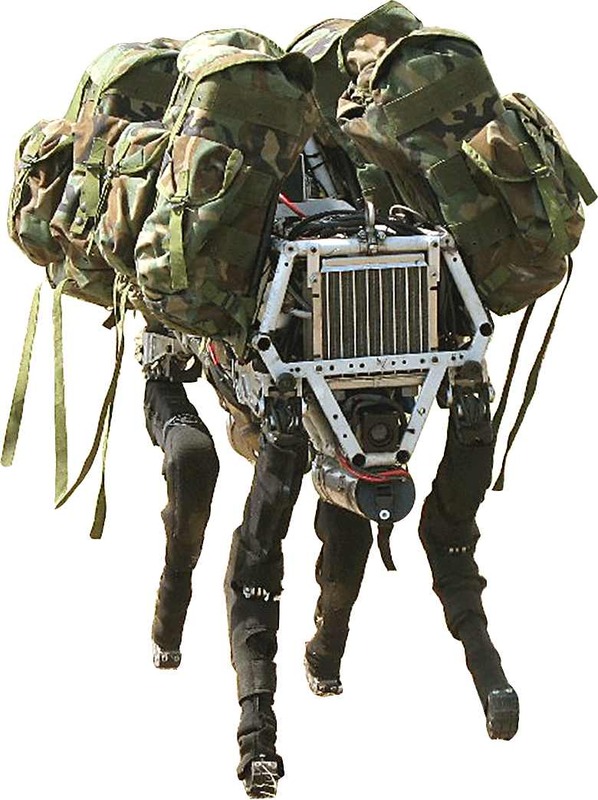 celebrating randomness: boston dynamic's military robot dog! Boston Dynamics, an engineering company that specializes in robotics and human simulation, has created one of the most fascinatingly creepy things I have ever seen - BigDog. This robot has a strikingly animal-like walk, due to its many sensors that help it judge its position, force and load. In fact, this robot can't be knocked down, although engineers gave it a good kick during the demo video. BigDog trots at about 4 mph, climbs slopes up to 35 degrees, walks across rough terrain, snow and ice, and carries a 340 lb load. And it is noisy... it sounds like a hive of buzzing bees. BUT - it can carry packs where humans can't or shouldn't go, and won't get spooked by gunfire. And it's come a long way since the 2006 model. The thing sort of creeps me out, but I strongly suggest you watch the video on the Boston Dynamics site, or catch it on YouTube. And, of course, as with anything new, somebody's got to make a parody. UPDATE (Dec 2010): Also very cool is the climbing robot - RISE.